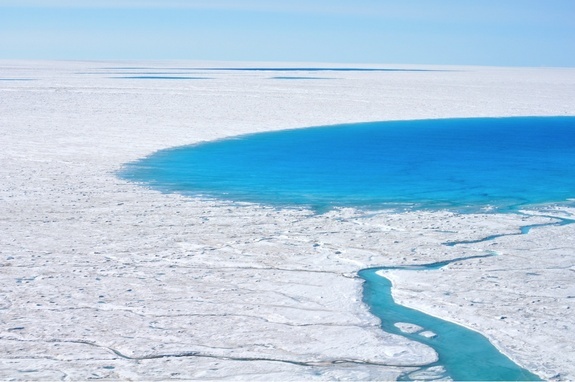 Geoscientists have solved a decade-long mystery of how some of the large lakes that sit atop the Greenland ice sheet can completely drain billions of gallons of water in a matter of hours. In 2006, Greenland’s North Lake, a 2.2 square-mile (5.6 square kilometers) supraglacial meltwater lake, drained almost 12 billion gallons of water in less than two hours. In a study published two years later, researchers determined that this astonishing phenomenon is possible because giant hydro-fractures(water-driven cracks) can form directly beneath the lake basin and stretch down to the bed of the ice sheet, emptying the lake of water. But just how these fractures developed has been unknown — until now. 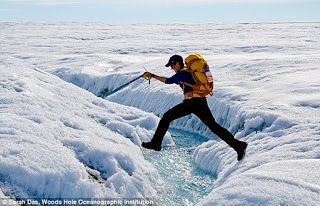 In the new study, published today (June 3) in the journal Nature, scientists using GPS technology discovered that the hydro-fractures form from tension-related stress caused by movements of the ice sheet. These movements are, in turn, triggered by the trickling meltwater. The new research may help scientists better understand how much the ice sheet is contributing to sea level rise, researchers say. Most of Greenland’s supraglacial lakes drain slowly when superficial streams route water into nearby, permanent crevasses or moulins (vertical conduits or shafts in a glacier). Fairly recently, however, satellite images showed that about 13 percent of the lakes drain quickly, emptying completely within 24 hours. The 2008 research, led by Stevens’ co-author Sarah Das, a WHOI geological scientist, showed that temporary hydro-fractures could cause rapid lake drainage on an unprecedented scale. But that research was unable to determine what triggered the cracks in the first place. Two other, similar studies of different rapidly draining supraglacial lakes were also unable to identify what caused the hydro-fractures. When meltwater in the summer drains to the bed from the ice surface through crevasses or moulins, it can cause the area within and around the lake basin to be “jacked up,” Stevens said. Additionally, it can decrease the surface area of the ice-sheet bed that’s in contact with the underlying bedrock, lubricating the bed and making it easier for the bed to move horizontally. Placed around North Lake, the team’s 16 GPS stations recorded these two types of movements — called uplift and slip — between 2011 and 2013. This provided an in-depth perspective on the meltwater injected into the bed before, during and after the yearly drainages. 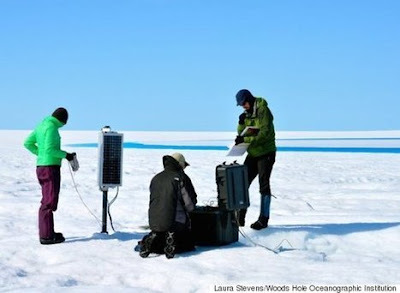 The study provides a clearer picture of the amount and location of the meltwater that travels down to the ice-sheet bed, which could help scientists better understand how fast the ice sheet flows during the summer, Stevens said.